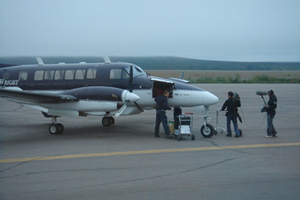 Commercial travel (including major highway access) is readily available to the neighboring town of Inuvik. The local travel section of the website includes various local methods of travel that can be used to get from Inuvik to Aklavik. The following airlines will fly from several destinations in Canada to the Northwest Territories. Once in the NWT, further travel arrangements will have to be made to Aklavik. These are outlined on the local travel page. The closest travel destination to Aklavik by major roads is to Inuvik, NT. Subsequent land travel can be accomplished via the ice roads or by chartered boat and plane as outlined in the local travel section. Please use the applet below to determine the best travel route from your location.